In brief: Desperation leads to desperate measures in which we were amply rewarded today. Terakawa Ramen closed down a couple weeks ago. Shocking because the place was always packed. We were desolate today, searching randomly on yelp and google for anywhere at all to have a hot bowl of ramen. Koa has not crossed our radar before. The interior is huge and has a clubby vibe and it bills itself as serving"modern chinese Cuisine". 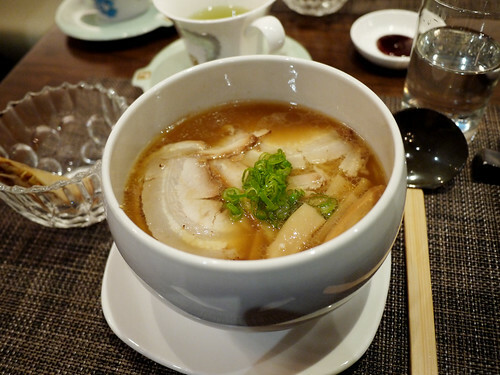 Not a place you would expect to find classic Chashu ramen, much less good Chashu ramen. But it was all that and more. The $14 lunch set consists of a delightful salad, a spring roll and a simple bowl of chashu, ramen and bamboo shoots. Perfect, perfect, perfect. Don't let the inefficient service or the fancy decor turn you off. It's absolutely worth a try in a neighborhood that serves up very little in the way of good Asian food.